This week’s Food Network Friday we’re featuring Alton Brown from the "Fry Hard" episode of "Good Eats" with a quick lesson in how to make perfect French fries. This little clip answered my question perfectly! I made "homemade" french fries for the first time tonight, and they were a little floppy... the second fry would have made them perfect. I'll know for next time! 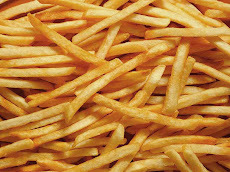 what procedure would you use if you wanted to freeze the fries between the 1st and second cooking? Such as time to cook, temp, frozen to oil, no thawing etc. Tommy, I honestly don't know the answer. That's the reason for the delay in getting back to you, as I was trying to find out. I would experiment and see what works best. Hope that helps.